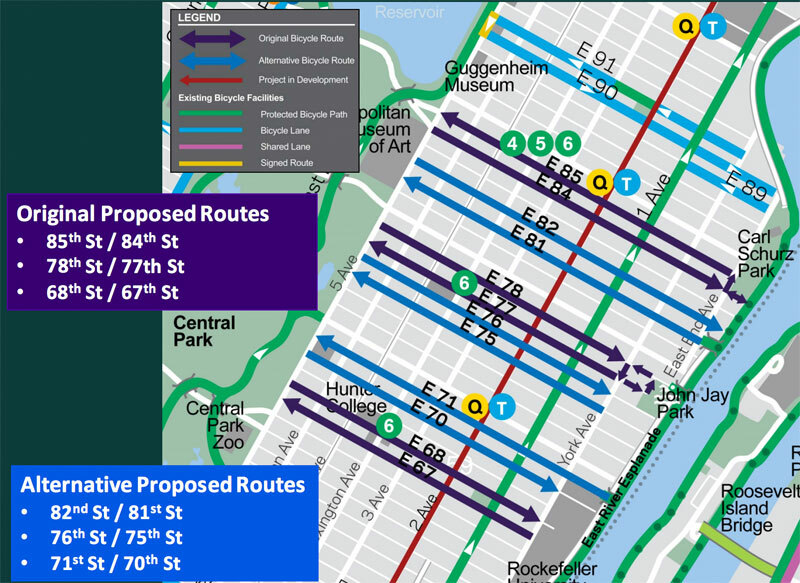 With Manhattan Community Board 8 failing to agree on three pairs of Upper East Side crosstown bike lanes, DOT will go ahead with painted bike lanes on 70th/71st and 77th/78th streets early next month. So concludes the year’s most ridiculous bike lane story, an epic drama that at one point outed Woody Allen as a full-on bike lane NIMBY. Advocates had hoped for a protected lane on 72nd Street, but DOT signaled early on that it would only consider painted lanes. These bike lane pairs are just thermoplastic stripes designating space for cycling, without any changes to parking spots or car lanes. Nevertheless, at meeting after meeting, people showed up in a panic about the possibility of bike lanes by their home, school, or workplace. Parents and administrators from schools on 84th and 85th streets, in particular, fretted over the purported threat to pedestrian safety, despite all evidence to the contrary. Last month, the full board finally voted on three pairs approved by the transportation committee: 70th/71st, 77th/78th, and 84th/85th. CB 8 Chair Jim Clynes attempted to force separate votes on each pair, but the board ultimately rejected all three lanes in one fell swoop by a vote of 19 to 25 with one abstention. While DOT is moving ahead with two pairs of bike lanes, the omission of the 84th/85th pair is telling. Without those streets, there will be no cross-town bike lanes between 78th Street and 90th Street. Looking ahead, Citi Bike is just beginning to reach the northern sections of the neighborhood. Even CB 8 has called for a long-term bike plan that uses “the safest appropriate design.” Bike advocates on the Upper East Side coalesced over this project, and soon enough they’ll be asking for more. How about a mid-block crosswalk on E 68th St between Lex and Park? And which combinations here are actually preferred? I bike on the UES myself but I stuck on waiting for the PBL on 2nd Ave. The cross streets are no big deal, minus the big ones E 86th St.
Did DOT not say anything specific about the decision on the lanes? It’s wonderful they’re moving forward to prioritize safety, but weird there is no statement, no? How much more bike traffic do streets with crosstown bike lanes get compared to their counterparts without bike lanes? I think the one on 85th is the most important. Good for the DOT! Community boards are not representative of their communities and regularly place ease of personal vehicle use over the safety of all other modes of transportation. I think it would have been better to put them on 72nd, 84th, and 85th Streets so that cyclists would be able to cross Central Park but this is still a good step. The city should officially call them “Woody Lanes” and put up a plaque recognizing them as so. I bet if they were to just stripe the lanes after they re-pave the roads no one would even notice them. It’s not like these change anything for cars. I was wondering that as well: why did DOT choose these particular streets? Was it due to road width or vehicular traffic volumes? Nevertheless, I see these as mainly hollow victories. I live on the far West Side of Manhattan and work on the far East Side. I have a lot of experience with these crosstown lanes. The ones in midtown are useless. They’re punctuated by sharrows and so parked and driven in that often it’s difficult to tell if and where they actually exist. The combinations on 20/21st and 9th/10th are a little better, but not good. There’s generally at least one driver parked in them each block (even when 9th becomes an upgraded curbside lane on Christopher), and you always need to pay attention for driving motorists passing too closely or parked motorists flinging their doors open. The block of Ninth Street around Seventh Avenue is particularly narrow and unnerving. I’ve taken photographs and written to DOT a number of times about it. Each time, they basically tell me to get lost: tell a Community Board; tell the NYPD; this design works great; it must be drivers parking too far from the curb (it’s not). DOT needs to push and install a protected by something crosstown lane prototype somewhere.Yes, some residents, or union members, or media outlets will throw a tantrum about the loss of free parking, but the lane will work well and give DOT evidence and public support to do the same elsewhere. Low-quality Class 2 projects like these for the UES aren’t going to help NYC become a “world class cycling city” or even a “Vision Zero” city. Unprotected bike lanes (UPBL) on crosstown streets only support the ‘interested but concerned’ people cycling..UPBLs are mainly to support drivers by reducing ‘owning’ the lane by people cycling. UPBL is a great designation! I’m disappointed they didn’t stick to their guns on all three lanes (purely personal interest: I live on East 85th and, as I told the CB8 meetings, I would have loved having my own personal bike lane). Still, good for DOT for ignoring at least _some_ of the NIMBYs. Anyone know why 84/85 wasn’t included? It seemed the least problematic of the pairs that were proposed. I remember a few years ago when there was some Community Board meeting about something to do with traffic on East 84th Street, and they were insisting that the street be closed during school drop off and pick up, lest their precious offspring get hurt by cars. I went to a private school on a side street on the UES, and the way we stayed safe was simply by learning not to play in traffic. Oy. They’re right. Their kids are important and we should rely on more than a child’s underdeveloped sense of restraint to keep them safe. If that means closing the street then so be it. It’s tough to tell sometimes with online communication, but are you being serious or sarcastic? There are over 3,000 schools in NYC. Do you think that 3,000 blocks should be closed to traffic every school day? I’m the last person to argue on behalf of car drivers, but even I think that’s ridiculous. Again, I went to elementary school on a relatively dense block on the Upper East Side, and we managed just fine without traffic being closed. I don’t think that drivers have gotten that much more reckless or that children have gotten that much more delicate since I was a child in the ’70s. Upper East Side Bike Lane Meeting, or Surreal Performance Art?